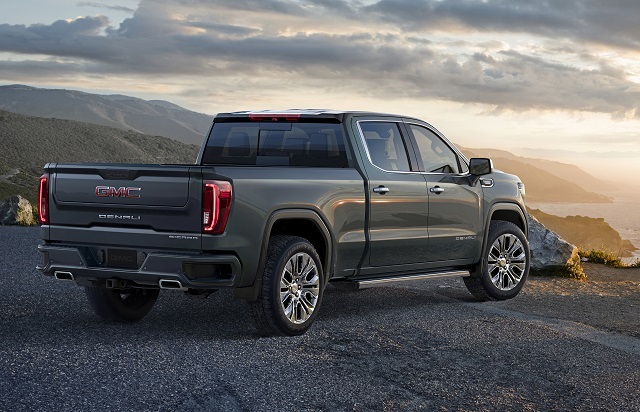 The half-ton GMC Sierra 1500 was all-new for the 2019 model year and for more extreme towing and payload capabilities the redesigned GMC Sierra HD debuted as the 2020 version. Both the light-duty and heavy-duty Sierra models stay behind the rivals and twin Silverado models regarding the max tow and payload capacity but the Sierra gets the credit for the high comfort and luxury features and flashy styling. The class-exclusive carbon fiber bed and versatile tailgate provide also the additional attention for the model. The Denali trim is also the signature of the Sierra trucks and it provides the max of comfort and available features. The light-duty Sierra Denali offers the unique interior appointments and premium features plus adds more chrome details and upgraded suspension. The model is also available with the full array of the advanced safety equipment. For the 2020 GMC Sierra 1500 Denali, the brand could add the turbodiesel engine option while will stay largely unchanged in other aspects. The model will arrive in the crew cab style only and with the short cargo bed. From the visual point of view, the 2020 GMC Sierra 1500 Denali will get the attention with flashier styling elements and unique wheel options. The model will wear the Denali signature grille treated with chrome and combined with the body-color bumpers. The aluminum polished wheels with 20 inches in diameter will be the base feature of the model and even larger 22-inch units will also be available. More stylistic details will include chrome window moldings, mirror caps, and door handles. The range-topping Sierra Denali will also offer versatile, six-way tailgate, carbon fiber cargo bed and MultiPro power assist steps. The Denali trim available only with the crew cab body will also provide the maximum interior comfort combined with the high-luxury features. The truck uses the authentic, stitched leather upholstery and mixes it with the attractive, brushed aluminum and open-pore wood pieces. The half-ton Sierra Denali packs also the heated and ventilated front seats and heated rear seats. The equipment list includes also a two-zone climate control, premium sound system, heated steering wheel and more. The tech equipment covers the latest infotainment system with an 8.0-inch touchscreen and navigation. The safety measures include adaptive cruise control, front and rear parking assist, forward collision warning with automatic emergency braking and blind-spot monitoring. 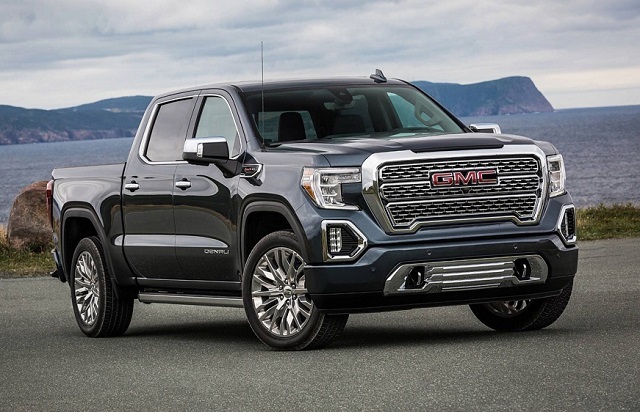 The power for the 2020 GMC Sierra 1500 Denali will provide a 6.2-liter V-8 engine with the power and torque capability at 420 hp and 450 lb-ft respectively. The engine underwent extensive upgrades for the recent redesign and comes with the fuel-saving technologies. The engine is a pair with the 10-speed automatic transmission. For the 2020 model year, GM should also bring a 3.0-liter Duramax inline-6 turbodiesel engine. The Denali version should also be available with the oil burner. The power it delivers should hit around 282 hp and torque around 450 lb-ft with the highway fuel economy around 28 mpg. The high-class 2020 GMC Sierra 1500 Denali will arrive in late 2019 with a price tag from around $55, 000.